With ASG cancelling the official Cape Monster event, and Emmerentia suffering an unfortunate stress fracture to her foot, it had seemed like my first 300km ride would be done solo. So it was a great relief to be kitting up in the car park of Paarl Mall at 5am with 3 fellow riders, and the rare luxury of a backup vehicle and drivers. Even before we rolled out onto the side streets of Paarl, it was evident that Andrew and Brendon, were capable of a considerably faster pace than I was aiming for, both of them being 3 hour Argus riders. Sure enough, after a couple of wrong turns and an early puncture for Brendon, we left the lights of town behind us and the blinking tail lights of the guys ahead slowly shrunk as the gap between us grew. Fortunately it was clear Pete was happy with a steadier pace, and we settled into a comfortable cadence. It was good to see that my lighting was passing it’s first real test – the combination of the Edelux dynamo powered light and the Lezyne Super Drive on it’s lowest beam setting threw plenty of light for us as we rode out into the dark of the morning. Rather less impressive were my GPS skills. Despite spending time plotting routes and waypoints, the eTrex hadn’t done any of the things I’d hoped for – not one turn indication, no lighting up and beeping on junctions, clearly I had some learning to do. With a long day ahead of us the last thing I felt like doing was adding delays by tinkering with technology. I did my best to ignore the annoyingly mute screen, and fell back on my memory of the route and Carinus and Janine in the backup vehicle confirming our directions through the first few turns. We were quickly through the deserted streets of Wellington and out onto the dark and winding lane leading to the first big climb of the day, a monstrous and majestic 35km up and over Bains Kloof Pass. Predictably I dropped back from Pete early on with the extra weight I was carrying, but rather surprisingly after the first few kilometres of climbing without really trying, I found I’d caught back up and we were riding together again. Equally surprising was seeing groups of runners looming out of the dark, not exactly what you expect to find on a remote high pass in the early morning. 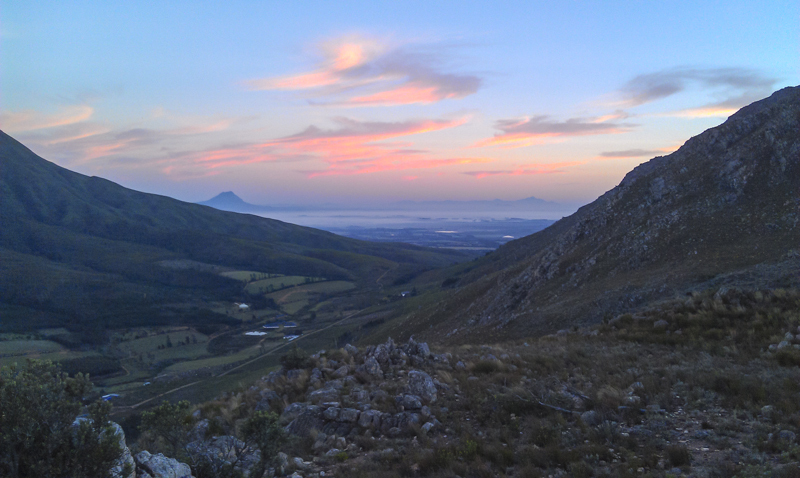 Conversation ebbed and flowed as the road twisted and wound up the hillside, and as we reached the long final straight to the summit a dim grey dawn light began to push back the darkness and reveal a stunning vista across the cape winelands to our left. With almost perfect timing, we reached the summit just as the sun was coming up, making for a perfect photo stop. Sadly that would be the last we would see of the sun for a while – the run down the other side of the pass was as cold as it was exhilarating. The damp mist we ran into at the foot of the pass clung around chilling us until Tulbagh when the sun was finally warm enough to drive it away. With around 70km on the clock, we decided to stop for a quick snack and leg stretch. I fished my phone out of the Ortlieb bar bag to text Yoli on our progress. With my earlier technological woes, it was good to find other parts of my setup that were working to plan. The dynamo had kept the cache battery and phone fully charged, despite running Endomondo for the whole ride so far. And because of having enough power to run this, Yoli had been tracking our progress live since part way through our climb up Bains Kloof. What was truly bizarre, was that through these little miracles of modern technology, Yoli had also “seen” the same runners we had, who clearly must also have also been running Endomondo. Starting out again, we immediately headed through the very scenic Nuwekloof pass – seeing the old pass and railway line to our left, it was fairly evident to see where it had got it’s name. Once through the kloof, we turned off right into Gouda, stopping briefly with Carinus and Janine to fill water bottles and grab supplies before heading on towards Porterville. Pete had mentioned some pain in his legs at our first stop, and it was clear by now he was beginning to struggle – he battled along for the next 20km, before pulling over to discuss whether he should turn back. As we chatted, we were confused to see Andrew and Brendon coming up behind us. 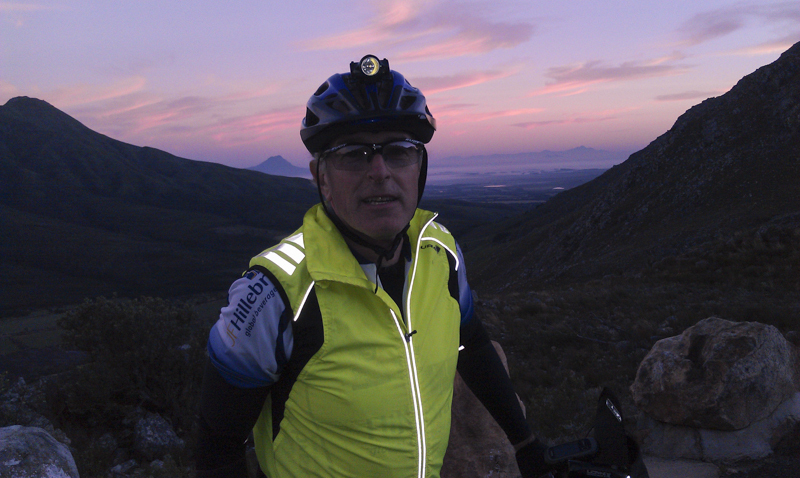 It transpired they had taking a wrong turn into Tulbagh, and racked up a considerable detour before getting back on course. Andrew suggested that we push on another 40km for lunch in Piketberg before deciding. Initially this seemed ok, but after a nasty little incline just before Porterville, Pete made the difficult decision to turn and head back. With around 120km in the bag, he would still end up clocking a very respectable 219km by the time he was back. The day was getting warm, and after the cheery bustle of a busy Porterville, the road to Piketberg was dull, hot, and rolling. The road surface was rough too, so I was beginning to get grumpy and disheartened as the first glimpse of town came into view. The featureless landscape crawled by, and I hardly seemed to be making any progress toward the distant buildings, despite the reassurance of a few road signs that were were not so weathered or battered that you could still make out the slowly reducing distance to lunch. By the time I pulled into the service station both water bottles were empty, and my spirits were almost as drained. With the clock reading just 145km, it was worryingly early to be in such low spirits and harbouring some serious self doubts. Some time off the bike did revive me, as I topped myself up with food and drink and restocked the bike with supplies. Words of encouragement from Janine helped pick me up as well, but the stop was over too soon and I was back on the bike heading out of the dusty, charmless service area and on to the busy N7. The Cape-Namibia Route sign at the roundabout brought a smile – a memory of a lovely camping holiday a couple of years back. We’d driven this same route, and had breakfast at this same service stop. I resisted the temptation to turn right and ride the 500km to Springbok, and instead swung left and headed for home. It was a relief to have reached the northernmost point of the ride, and to know that every pedal-stroke put more kilometres behind than ahead, but the going was far from easy. The downside of having driven this route was knowing that after the brief free-wheel down from Piketberg, the 25km to Moorreesburg was one long sequence of massive rollers. Slogging up each rise, trucks and cars thundering by, I felt small, alone and insignificant. I’ve never dropped to such a low whilst cycling, I began to seriously doubt whether I could finish the ride, and LEL started to seem a ludicrously distant and unattainable goal. Faced with the prospect of quitting, I went back to basics, dropped into easy gears, only looked one peak ahead at a time, and stuck at the task trying to shut out the mutinous voice inside. 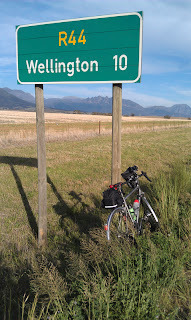 The wonderful inevitability of cycling is that if you can keep pedalling, you can cover any distance – and sure enough, despite my misgivings, the agricultural town of Moorreesburg eventually lay beneath me as I crested the last of the rollers. I was glad to see the back of the N7 as I turned left towards Riebeeck, and even gladder to see the support vehicle parked just ahead. Resisting the temptation to vent a torrent of misery, I chose a more refrained “the legs are good but the tank is feeling a little empty” when asked how I was doing. Andrew had got lost again, ending on a dirt road back to Gouda, and was just disappearing ahead as I stuffed my face with food and gulped down Coke until I felt vaguely human again. With 180km on the clock, and around 80km still to go I abandoned my “no energy drink” plan and put some Cadence Classic in my rear bottle before setting off. I’m not sure if that made the difference, or the change of scenery on this quieter more peaceful road, but my spirits lifted and I was enjoying riding again. At 200km I stopped quickly for a banana and to let Yoli know I’d hit the magic double century mark. It was great to see several “keeping going, we love you” messages waiting for me in return. Thankfully she had forgiven me for being out all day riding on our anniversary, and also leaving her to battle the school fete alone. It’s easy to forget our whole families ride these rides with us in the time they give up for us. The afternoon shadows were lengthening and I was smiling inside. 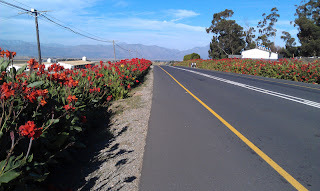 The views were insanely pretty on the outskirts of Riebeeck West, vineyards either side of a flower lined, freshly tarred section of perfectly smooth road. The kilometres were slipping by quickly again, the pace picking up with my improving mood. 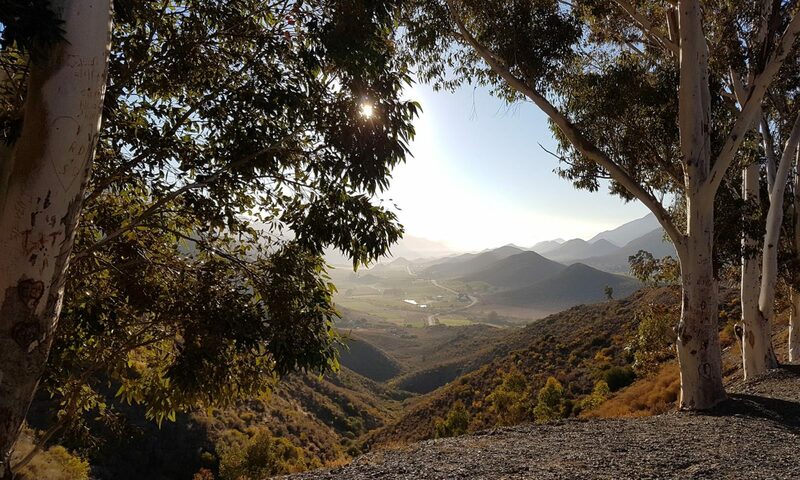 It was a welcome change to be riding through quaint villages, and the nearby Riebeeck Kasteel was also a delight to ride through, with people milling between shops, cafes and wineries. Beyond Riebeeck I was back on familiar roads, and for the first time in quite a few kilometres it struck me that I was actually going to complete this ride. Carinus and Janine topped me up one last time, and departed for dinner in Paarl, having checked I knew the remainder of the route back. I couldn’t resist the temptation to snap a road sign just outside Wellington which seemed to celebrate nicely how far I’d come and how little there was left to do. I stood for quite a few minutes enjoying the moment, and the late afternoon light before mounting up for the final stretch. My tummy was beginning to feel decidedly crampy, and the energy drink really wasn’t working any more. So I stopped in Wellington at a winkeltjie for a coke, and for the first time ever I found myself riding on an old classic “coke and water” mix in my bottle. This was the trusted fuel of many cyclists before the popularity of modern energy drinks. It worked too. I didn’t break any speed records on those last few kilometres into Paarl, but I wasn’t flagging either. One last moment of glorious irony found me in those final stretches – the GPS woke up, and started telling me where to turn. I was less than 3km from home, and knew exactly where to go, and now, when I needed it least, the technology decided to give me a helping hand. The total distance for the day was 260Km, which I had ridden in 12:40. By starting in Paarl rather than the planned start of Allee Bleu for the official event, we were always going to be a little short of the full 300km, and I have to say my legs were thankful for that as I pulled up to the car. I could probably have made the extra 40km, but that was irrelevant. The day had served it’s purpose in testing me and the equipment to it’s limits. I was extremely happy with the time, it was significantly quicker than I had expected and way above the pace I’d need or be aiming for on LEL. Most importantly, I’d managed to keep pedalling through a seriously low patch and complete my longest ride to date. Hopefully it gets easier from here! All photos by author . Thanks for making me wipe the tears away!